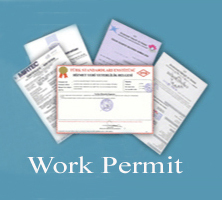 Work permit is one certificate that Vietnam government permit foreign labors (Expats) working in Vietnam legally. In Vietnam, work permits are valid for a maximum of three years depending on the contract. Under the Labor Code draft submitted last year and the latest update regulation about Vietnam work permit for Expats is Decree 46/2011/ND-CP issued at 17th June 2011 and Circular 31 at 3rd November 2011 providing guidelines on the implementation of Decree 46 and help all Expats in Vietnam understand that how to Obtain a work permit in Vietnam.  Not having previous conviction for infringement of national security; not facing examination of penal liability and not serving a criminal penalty as prescribed by Vietnamese or foreign law.  Employers may recruit foreigners who ensure all Requirements For Foreign Citizens (Expats) to work in Vietnam as managers, executives or specialists when Vietnamese laborers are unable to meet production and business requirements. • Legal record issued by the authorized body of the country where the foreigner resided prior to coming to Vietnam. If the foreigner has currently resided in Vietnam for six (06) months or more, then there need only be a legal record issued by the Vietnamese Department of Justice of the locality where the foreigner is residing. • Health certificate issued overseas or health certificate issued in Vietnam in accordance with the regulations of the Ministry of Health. • 03 (three) color photos (3cm by 4cm in size, bareheaded, frontal view, showing the face and ears clearly, without glasses, and on a white background) taken within the last six (06) months from the date on which the foreigner lodges the application file.  Any documents as Legal record, Health certificate, Certificates of specialist, which is in foreign language must be translated to Vietnamese and notarized in accordance with the law of Vietnam. To obtain Vietnam Work Permit Support Authorization (Official Work permit from Vietnam), please come to http://www.rushvietnamvisa.com/work-permit/ for more assistance. I'm currently living in Vietnam and teaching online. Language centers just don't allow it but you can google a webpage with key word "eduu.vn". They are the source of learners through the whole country and maybe they have learners outside their country also. You can post about yourself and if someone wants to they will contact you. The page doesnt charge anything.